Pumpkin Maple Caramel Sauce for sale. Buy online at Zingerman's Mail Order. Gourmet Gifts. Food Gifts. Before your eyes glaze over at the thought of yet another “pumpkin spice” product let me stop you right there. This isn’t a fad or someone trying to capitalize on the latest trend of pumpkin popularity. 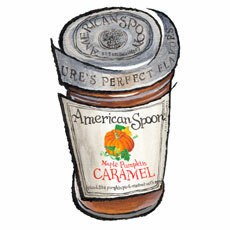 Made by American Spoon in northern Michigan, one of the country's premier preserve makers, this is slow cooked pumpkin, spiced up like pie, blended with rich, buttery caramel and maple syrup from nearby farms. It's addictive. Slather it over everything. Eat it off the spoon. Top your gelato with a dollop or two. Then tell those trend chasers you found an incredible caramel that will never go out of fashion.